Inspired by a similar musical production in Hamburg and on the initiative of Norbert Hofer, several music enthusiasts met at a pub in Vienna in 2002 in order to discuss the idea of producing such a musical on their own. However, the group did not comprise an existing ensemble but musicians who had met at several different occasions and performances in the course of their yearlong music activities. This is how it came about that an editorial team comprised of four members (Alex, Birgitt, Norbert, and Sonja) was formed, thought up a story that would fit our favorite oldies, and made a final choice of 24 songs from originally 72 pieces – four full CDs after all! This, of course, did not happen in 'closed sessions' but by the enthusiastic participation of the rest of the ensemble's members (it rarely happens that one receives such a huge number of emails in one summer...!). Beginning in fall 2002, Alex and Norbert concentrated on the choral movements, Marietheres, Renate and Susanne developed the choreography for the dance numbers, and the choir started practicing. Along the way, Norbert spent night after night creating the homepage of the association 'dream-music-company', which was specially founded to turn the project into reality. At this point the ensemble's membership seemed complete as well. However, considering the project's turmoil, it won't come as a surprise to anyone that two more people joined in the winter and another one left. Organizing the rehearsals turned out to be a major problem. Since all participants have jobs and family, some are undergoing education, and most are members of other ensembles, coordinating people's few sparse dates in their free time proved no easy task. Birgitt volunteered and took over this difficult task, for which none of us envied her. Coordinating twelve people's schedules is anything than easy! Modern communication forms such as email and the internet once more proved of great value to us, which is also how we shared the sheet music. This is how we were able to keep all participants up to date. After meeting twice each week for rehearsal, we finally had sufficiently studied the songs by February 2003 and, beginning in March, were able to turn to practicing the scenes. And finally, at the end of May 2003, our dream became reality: 'Sun of Jamaica' premiered with three sold-out shows! Following 'Sun of Jamaica's' sensational success in 2003/2004, we spent a long time on the look-out for a story to follow up with. It was our goal to bring another story on stage that was supposed to be lighthearted and easy-going without becoming superficial. Based on Karin Beisteiner and Sonja Latzin's idea of writing a story centering on an aging rock star, Jutta Tidl (our new director) and Norbert Hofer created a witty story about musician Johnny Starr, a story that stays gripping until its conclusion. The plot is of course accompanied by numerous hits tracing an arc across five centuries of music history. One special feature of this production was our close cooperation with the 'Fachschule für Sozialberufe' ('Faculty of Social Professions') Stockerau. Marietta Bohn, one of our ensemble's members, put us in touch with the FSB in 2002. Marietta runs a theater group at this school for which we have been able to provide musical and technical support several times in their stage performances during their school festivals. Four female students of the FSB Stockerau participated in the rehearsals from the very beginning and performed dances at the premiere of 'Johnny Be Good – tonight!' at the 'TV Ballet'. Subsequently another performance took place at the event facility 'Z 2000' of Stockerau on April 30, 2008. The event was part of the school festival of 2008 and was completely sold out. Additional performances by a delegation from the FSB's partner school in Baranowitschi/White Russia added a special flair to the event. In May 2008 we in turn were able to present parts of our musical at the University of Foreign Languages in Baranowitschi/White Russia. In addition to all this, another performance of 'Sun of Jamaica' at the VAZ 'Z 2000' was again completely sold out. Mid-August 2009 saw the 40th anniversary of one of more recent music history's most important events: the Woodstock Festival. This event not only changed the music scene in a lasting way, it also had a profound impact on society's sociopolitical culture. We tackled this subject and created the musical 'Summer of Love', a rousing show which resurrects the era's attitude towards life by recreating the sound of the late 60s. The premiere took place exactly on the Woodstock Festival's 40th anniversary on the Donaupark stage on August 15/17, 2009, attracting an audience of 1500. Eight more performances followed in Vienna and Lower Austria in September and October. The year 2009 marks a historic date for us for even another reason. What with the number of productions reaching an extent by now which we were no longer able to manage merely with the capacities at our disposal, we reached the decision that management of future events should be outsourced to an independent organizational structure. At the same time, we felt that our know-how and the existing infrastructure should be put at other artists' disposal. It was thus that MMZ – MultiMediaZentrum kulturmarketing und kulturmanagement (MMZ – MultiMediaCenter for cultural marketing and cultural management) was created with the goal of providing artists with an organizational structure that would allow them access to a wide array of offers in the fields of IT, multimedia, and event technology. It is this institution's goal to support artists from the most diverse fields in marketing their products. This year saw our group organizing the first open-air event in Favoriten. The event was meant to make a statement about the enormous contribution to our city's cultural life made by immigrants from other countries. Artists who originally stem from the five continents and now live and work in Vienna offered us a fascinating glimpse at their world. In addition, intercultural music and dance workshops as well as a culinary framework program were offered. The catchy and electrifying Gospel- and Spitualsongs embedded in an exciting plot, formed the framework of our new musical production: 'JORDAN - The Gospel Musical'..
With the ensemble comprising 20 members and as always accompanied by a live band, JORDAN was our biggest production to date. The premiere, part of the Summer Open Air Festival Stockerau, turned out to be a huge success with the audience and drew a great deal of attention to our ensemble on a national as well as international level. Much of this was due to the sensational and top-class ensemble which brought a fantastic show on stage. In the wake of the premiere's overwhelming success at the Summer Open Air Festival Stockerau, 'JORDAN – The Gospel Musical' went on tour in the fall of 2012! Organizing nine performances by 20 ensemble members in Lower and Upper Austria as well as Vienna posed a huge challenge. We would like to give thanks to the wonderful audience which helped to make JORDAN another great success in 2012! It was also in 2012 when the members of our music ensemble held the first 'dmc academy', which gives music enthusiasts the opportunity to study various pieces of music within the framework of several projects and under the guidance of professional musicians in order to improve their personal skills. The Per Albin Hansson Estate celebrated its 40th anniversary by participating in the Favoriten Festival of Culture(s) 2012. At the same time, the festival was the opening shot of our series of events at the open air arena at Volkspark Laaerberg, by which we were able to bring back life to this beautiful location. This year we managed – despite our modest means – to organize as many as ten events on the stage of Volkspark Laaerberg each Saturday throughout the summer. What with the stage lacking a roof, this turned out to be quite a risky game; however, the weather god meant us well and we did not have to cancel even one single event. During the Advent season of 2013, we brought on stage Jutta Tidl's play 'Christmas Miracles – Do They Exist After All?!'. When the play premiered at the Wiener Ateliertheater in 2009, the audience was touched and exhilarated by its wit and charm. Atmospheric songs contributed to a perfect evening for the whole family. The perfect way to begin Christmas season. In lack of sufficient public funding, we were unable to fill the stage calendar throughout the whole of summer. 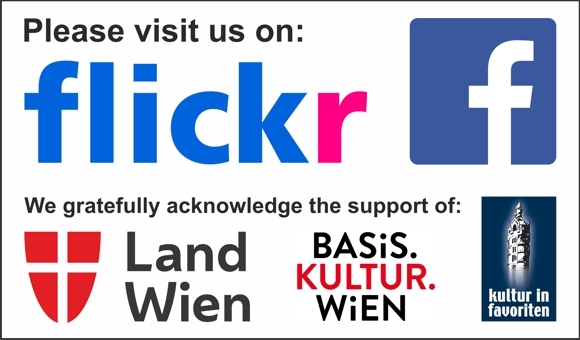 We were forced to reduce the program to two events: one contribution to 'Wir sind Wien – Festival der Bezirke 2014' ('We are Vienna – District Festival 2014') and a three-day event titled '3 days of peace and music', with young artists interpreting songs of the hippie era. Due to a lack of public funding, 2015 was another year when we were only able to bring a reduced version of our program on stage. However, in the very same year we found ourselves confronted with a mega-project: the 'Inclusive Sound Festival 2015'. This event gives a platform to musicians with or without disabilities who make music together to present their work to a broader public. The project is undertaken in cooperation with the University of Music and Performing Arts as well as the Vienna School of Music. On the occasion of the festival we have produced a song which, in line with the festival's motto, is performed by singers with and without disabilities. This song was produced with the support of the University of Music and Performing Arts Vienna and the Vienna School of Music. Apart from participating in 'We Are Vienna – District Festival 2016', we also organized a wellness weekend at Volkspark Laaerpark, including yoga sessions and, of course, lots of music. The year of 1967 entered history as the 'Summer of Love'; its 50th anniversary took place in 2017. In this event, we shed a light on the musical-cultural background of the era and try to find out about the impact it made on Viennese society. Based on the broadcast series by musical expert Karl Warlischek, we will delve into the era's esprit and provide background information on the flower power movement's golden age, all accompanied by live music of the hippie generation. Our theme-based weekend '50 Years of Summer of Love' was received enthusiastically by the audience. As a continuation of our program of the previous year, we will organize another weekend, this time on the subject '50 Years of Summer of Revolution', dealing with the sometimes dramatic events of 1968. The year of 1968 was shaped by massive political and social upheaval, such as the Vietnam war, the Prague Spring, or the student uprisings in Germany and France. Based on the broadcast series by music expert Karl Warlischek, we will shed light on the year's historic events and the various ways they took an influence on the European and American music scene. The association 'dream-music-company' takes no responsibility for the correctness of the information provided on this website concerning up-to-dateness, accuracy, completeness or quality. Liability claims against the association concerning damage of a material or non-material nature, caused by use or non-use of the information presented, or, respectively, by use of erroneous and incomplete information, are generally excluded, insofar as there is no demonstrable fault of an intentional or grossly negligent nature on the part of the association. All offers are nonobligatory and nonbinding. The association 'dream-music-company' expressly reserves the right to change, expand or delete website content, in whole or in part, or cease publication of the website temporarily or permanently, without prior notification. Insofar as the association 'dream-music-company' refers directly or indirectly to external internet sites ('links'), it is liable only if it has knowledge of the content of these sites and, insofar as technically possible and reasonable, is able to prevent their use in case of illegal content. The liability for content over and above this and especially for damage incurred by the use or failure to use information offered in this way shall lie exclusively with the provider of the page referred to and not with those merely referring to the respective publication by means of links. This limitation equally applies to third-party entries in guestbooks provided by the association 'dream-music-company', discussion forums, and mailing lists. In all of its publications, the association 'dream-music-company' strives to respect the copyrights of any graphics, sound documents, video sequences or texts used, to use graphics, sound documents, video sequences and texts which 'dream-music-company' has itself created or to make use of graphics, sound documents, video sequences and texts which are not subject to licenses. The copyright © for those objects published and created by the association 'dream-music-company' remains solely with the association.